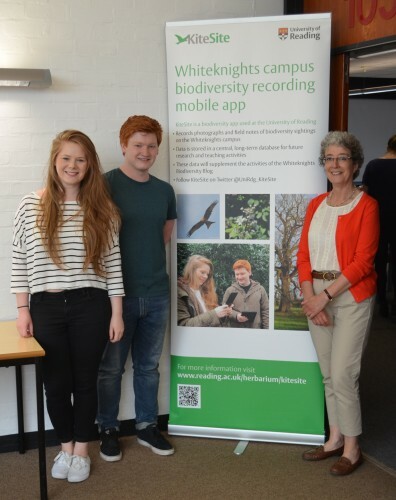 The University has launched its biodiversity mapping tool, KiteSite, which is to be used in teaching to track sightings of plant and animal life and, through GPS, map their location on campus. The tool was developed from existing open-source software by a joint team of biologists, computer scientists and designers as part of a University-funded Teaching and Learning Development project. Typography and Graphic Communication student, Liam Basford (pictured centre), developed the branding and communications for the project. He is with Bethany Everett (left), one of a group of student volunteers who tested the tool, and Alison Black, of Centre for Information Design Research, who was part of the academic team involved in the project.